We are a family-run fifth generation Cornish butcher with our own farm. Quality and animal welfare are of the utmost importance to us. 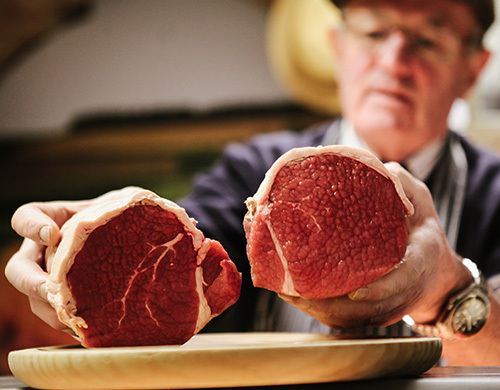 Our specialty products have earned us an excellent reputation and tourists to the West Country have always come to Fowey to sample our famous sausages, traditionally cured bacon and cooked meats. As farmers and butchers we know the animals and we believe that the best meat comes from happy, well cared for animals that can enjoy a life in the fields. Situated next to the church in the centre of Fowey you will find our shop stocked with a wide range of local produce. We have a meat counter, extensive cheese range, fresh fruit and veg, fresh bread, pasties, cooked meats, jams and tracklements. We have a fantastic range of home baked pies, quiches and cakes all made on our farm by Jane. Find us in the heart of Fowey, next to the Ship Inn and the church. 1-3 South Street, Fowey, Cornwall. PL23 1AR.